With “The Ultimate Fighter: Live” launching this past Friday, it’s easy to forget the reality show’s international counterpart has also begun filming and will make its debut later this month. “The Ultimate Fighter: Brazil” premieres March 25th and will air every Sunday night on Globo. Although an official announcement has yet to be made, FUEL TV is expected to broadcast the show in North America. 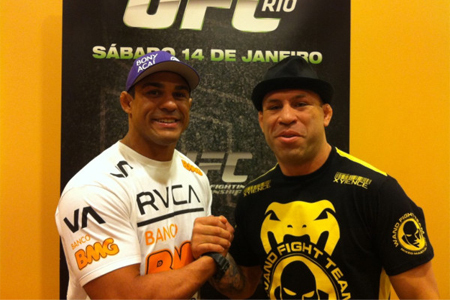 Vitor Belfort and Wanderlei Silva (Pictured) will serve as opposing coaches in the series’ first non-American edition. The Brazilian icons will tutor featherweights and middleweights as they battle to secure their futures with the world’s premier mixed martial arts promotion. Each tournament winner will receive a six-figure UFC contract. The season’s finale will take place June 16th at a yet-to-be announced venue in jiu jitsu country. Belfort and Silva will collide in the card.